100 % Genuine Goat Leather. Strong, light-weight goat leather, tanned without the use of chemicals. Usage: ,Duffle-Bag, Luggage-bag,Weekend-Bag, overnight travel bag, Shoulder Bag. Color and texture of the leather varies. 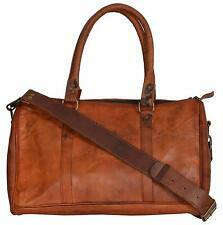 Handmade Genuine Leather Satchel Duffle/Gym Bag Bag. HANDMADE LAPTOP SATCHEL BAG. 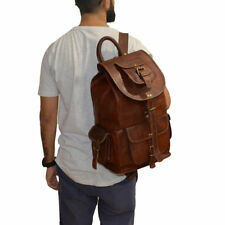 Each bag is individually made using goat leather by experienced crafts people. Green canvas fabric. QUALITY LEATHER BAG. Mens Genuine Leather Vintage Laptop Shoulder Briefcase Messenger Bag Satchel 14"
Each bag is uniquely individual due to slight color and marking variations on natural leather. Front 1 Big Pocket. Strong, light-weight goat leather, tanned without the use of chemicals. Color and texture of the leather varies. Material- Real Goat hide. 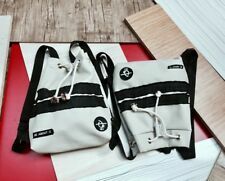 Inside green color waterproof canvas lining. 1 Front pocket and both side pocket. 56" long adjustable length shoulder strap. Eco friendly and weather proof bag. Strong, light-weight goat leather, tanned without the use of chemicals. Each bag is uniquely individual due to slight color and marking variations on natural leather. We do provide Silica Gel inside the Pockets so that your item does not catch any fungus. These are unmistakable identification of leather and in no way lessens the beauty or quality of the leather. All of our product are made with 100% Genuine Leather. HANDMADE DUFFLE BAG. FOR TRAVEL,GYM & WEEKEND BAG. 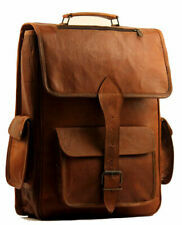 Each bag is individually made using goat leather by experienced crafts people. Green canvas fabric. QUALITY LEATHER BAG. Front Have 1 Big Pocket. Each bag is uniquely individual due to slight color and marking variations on natural leather. The absolute highest quality knife roll available anywhere. 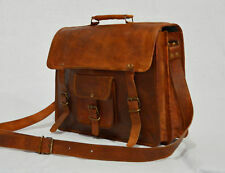 Handmade oil pull up leather, briefcase kinfe roll bag. We do provide Silica Gel inside the Pockets so that your item does not catch any fungus. Crafted of beautiful full grain cow hide, this satchel is heavy duty and rugged. Two heavy duty buckles up front really wrap down the satchel for maximum security for your treasures. We do provide Silica Gel inside the Pockets so that your item does not catch any fungus. The bag is entirely handmade from cutting the leather, punching the holes and sewing (with 1mm waxed thread ) painting the edges riveting etc. This bag size is . BRIGHT SIDE OF PHOTO IS SELECTED AND THEY ARE BRIGHT DUE TO HEAVY FLASH AND LIGHT. We Hope For Your Positive And Prompt Reply. We Assure You About Our Good Services With Product Quality And Intricate Details At So Matchless Price And Every Possible Images. This leather is 100% natural goat skin leather.All of our bags are handmade, and can be modified to your custom specifications. (1) two front pocket and one inside pocket with zipper (2)Two adjustable shoulder belt. 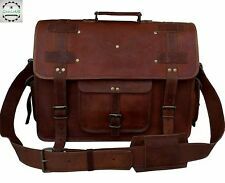 Genuine Leather Vintage Laptop Messenger Handmade Briefcase Bag Satchel 11"X15"
A genuine hand made product using chemical/dye-free leather. Natural oils and light have been used to obtain the style of the leather - chemical free! Handmade in India by experienced crafts people. Full grain boot type leather, will last probably for another hundred years. Only full grain leather, rivets, D-ring and heavy duty polyester threads. Crisp leather. Ready to use. See detailed pictures. mens brown leather bag office Briefcase Laptop Messenger Shoulder Bag 14"
We do provide Silica Gel inside the Pockets so that your item does not catch any fungus. These are unmistakable identification of leather and in no way lessens the beauty or quality of the leather. Get this bag customized to your needs ! 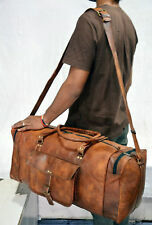 Handmade Genuine Leather Satchel Duffle/Gym Bag Bag. HANDMADE LAPTOP SATCHEL BAG. 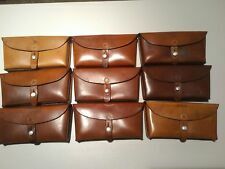 Each bag is individually made using goat leather by experienced crafts people. Each bag is uniquely individual due to slight colour and marking variations on natural leather. Leather with interior lining, Color Brown (pictures may vary depending in your cellular or monitor settings). Observe photo # 7 show a loose thread, Preowned bag in good condition. It fits 13" laptop, 14" laptop, 11" MacBook or 13" MacBook. We do provide Silica Gel inside the Pockets so that your item does not catch any fungus. - Adjustable shoulder strap, which is also detachable. Full grain leather. Large slip pocket for a laptop, padded, along the back panel. Can hold a laptop maximum 38 cm x 43 cm. One large exterior pocket, fastened with two vertical zippers (both for a left and for a right hands). Color: Dark Browns. Material : 100% Genuine cow leather. Outside :1 front zipper pocket,1 back zipper pocket. 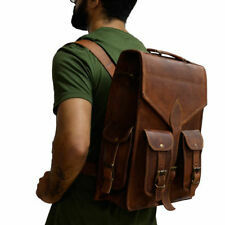 HEAVY-DUTY bag made from thick saddle leather. All leather bag including interior. Interior- unlined, just beautiful raw leather with massive scuffing. Otherwise is clean and odorless. All the cracking are very superficial and not affecting the integrity of thick leather. The absolute highest quality knife roll available anywhere. We do provide Silica Gel inside the Pockets so that your item does not catch any fungus. All of our product are made with 100% Genuine Leather. Vintage Medium Brown Leather.Handmade Shoulder HandBag 8", 13.5", 7", 44"
Material: genuine leather. · Color: dark brown. 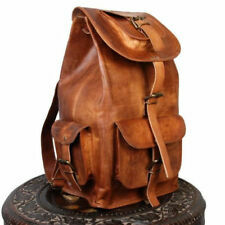 The bag is about 8" H, 13.5" D, and 7" L.
Each bag is individually made using goat leather by experienced crafts people. QUALITY LEATHER BAG. We ensure to keep it confidential. Each bag is uniquely individual due to slight color and marking variations on natural leather. (the 2 front pockets are covered by main cover of briefcase.). Material: 100% Genuine Leather and Aguayo cloth (Traditional Fabric from Andes) made of wool. The aguayo is most associated with Quechua and Aymara culture but is not exclusive to them.